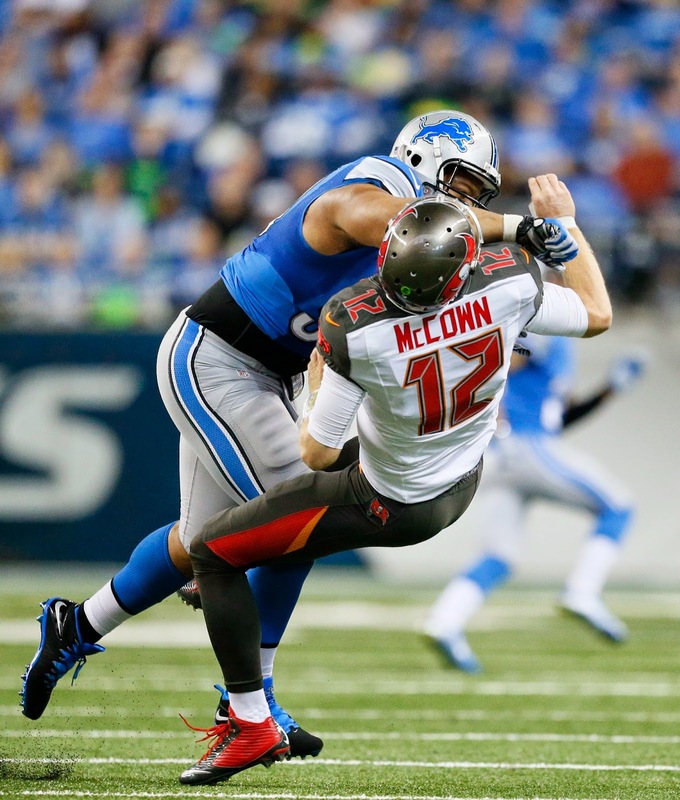 - The impact of the Lions' defensive line is starting to show. Josh McCown is being hit a lot after releasing the ball. The Lions will have to be careful not to get roughing the passer penalties. Suh and Ziggy Ansah could have easily drawn ones in the third quarter. - Matthew Stafford has been efficient today. He hasn't tried to do too much. And he doesn't have to. The deep throws to Calvin Johnson have had a big impact on this game (each thrown over 60 yards in the air). The Bucs secondary is playing unusually deep even for a Tampa Bay 2 team. The Lions are hitting the underneath stuff now. He is 57 of 75 (76 percent) for 668 yards and four TDs and no interceptions last two games. - Thanksgiving vs. Chicago and today we are seeing why Calvin Johnson is, well, Megatron. He's been terrific. - Sometimes overlooked is Stafford's field awareness. Like tossing that botched snap out of bounds. There was not going to be any grounding on the play because he was out of the pocket.